Prior to computer memory-based samplers, musicians used tape replay keyboards, which store recordings on analog tape. When a key is pressed the tape head contacts the moving tape and plays a sound. The Mellotron was the most notable model, used by a number of groups in the late 1960s and the 1970s, but such systems were expensive and heavy due to the multiple tape mechanisms involved, and the range of the instrument was limited to three octaves at the most. To change sounds a new set of tapes had to be installed in the instrument. The emergence of the digital sampler made sampling far more practical. The earliest digital sampling was done on the EMS Musys system, developed by Peter Grogono (software), David Cockerell (hardware and interfacing) and Peter Zinovieff (system design and operation) at their London (Putney) Studio c. 1969. The system ran on two mini-computers, Digital Equipment PDP-8's. These had a pair of fast D/A and A/D converters,  12,000 (12k) bytes of core memory (RAM), backed up by a hard drive of 32k and by tape storage (DecTape). EMS equipment was used to control the world's first digital studio (EMS London (Putney) Studio), and their earliest digital sampling was done on that system during 1971-1972 for Harrison Birtwistle's "Chronometer" released in 1975. The first commercially available sampling synthesizer was the Computer Music Melodian by Harry Mendell (1976), while the first polyphonic digital sampling synthesizer was the Australian-produced Fairlight CMI, first available in 1979. These early sampling synthesizers used wavetable sample-based synthesis. Since the 1980s, samplers have been using pulse-code modulation (PCM) for digital sampling. [unreliable source?] The first PCM digital sampler was Toshiba's LMD-649,[unreliable source?] created in 1981 by engineer Kenji Murata for Japanese electronic music band Yellow Magic Orchestra, who used it for extensive sampling and looping in their 1981 album Technodelic. The LMD-649 played and recorded PCM samples at 12-bit audio depth and 50 kHz sampling rate, stored in 128 KB of dynamic RAM. The LMD-649 was also used by other Japanese synthpop artists in the early 1980s, including Chiemi Manabe and Logic System. The E-mu SP-1200 percussion sampler, upon its release in August 1987, popularized the use of digital samplers within hip hop music in the late 1980s. Akai pioneered many processing techniques, such as crossfade looping and "time stretch" to shorten or lengthen samples without affecting pitch and vice versa. 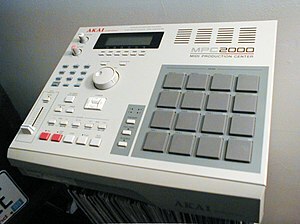 The Akai MPC60, released in 1988, went on to become the most influential sampler in hip hop music. During the 1980s, hybrid synthesizers began to utilize short samples (such as the attack phase of an instrument) along with digital synthesis to create more realistic imitations of instruments than had previously been possible. Examples are the Korg M1, Roland U-110, Yamaha's SY series, and the Kawai K series of instruments. Limiting factors at the time were the cost of physical memory (RAM) and the limitations of external data storage devices, and this approach made best use of the tiny amount of memory available to the design engineers. The 2010s-era music workstation usually uses sampling, whether simple playback or complex editing that matches all but the most advanced dedicated samplers, and also includes features such as a sequencer. Samplers, together with traditional Foley artists, are the mainstay of modern sound effects production. Using digital techniques various effects can be pitch-shifted and otherwise altered in ways that would have required many hours when done with tape. Usually a sampler is controlled by an attached music keyboard or other external MIDI controller or source. Each note-message received by the sampler accesses a particular sample. Often multiple samples are arranged across the keyboard, each assigned to a note or group of notes. Keyboard tracking allows samples to be shifted in pitch by an appropriate amount, typically in semitones and tones. Each group of notes to which a single sample has been assigned is often called a "keyzone", and the resultant set of zones is called a keymap. For example, in Fig 1, a keymap has been created with four different samples. Each sample, if pitched, should be associated with a particular center pitch. The first sample (Violin G#2) is distributed across three different notes, G2, G#2, and A2. If the note G#2 is received the sampler will play back the Violin G#2 sample at its original pitch. If the note received is G2 the sampler will shift the sample down a semitone while the note A2 will play it back a semitone tone higher. If the next note (Bb2) is input the sampler will select the Violin B2 sample, playing it a semitone lower than its center pitch of B2. In general, samplers can play back any kind of recorded audio. Most samplers offer editing tools that allow the user to modify and process the audio and apply a wide range of effects. This makes the sampler a powerful and versatile musical tool. A sampler is organized into a hierarchy of progressively more complicated data structures. At the bottom lie samples, individual recordings of any sound, recorded at a particular sample rate and resolution. While a common sound to sample is a musical instrument being played (e.g., a pianist playing a piano note or an organist playing a pipe organ), a sample could be any sound, including "non-musical" sounds such as a typewriter clacking or a dog barking. A reference center pitch indicates the actual frequency of the recorded note. Samples may also be "looped" by defining points at which a repeated section of the sample starts and ends, allowing a relatively short sample to play endlessly. In some cases, a "loop crossfade" is indicated, allowing less obvious transitions at the loop point by fading the end of the loop out while fading its beginning in. Keymaps are arranged into instruments. At this level parameters may be added to define how the keymaps are played. Filters can be applied to change the sound-color while low frequency oscillators and envelope generators can shape the amplitude, pitch, filter or other parameters of the sound. Instruments may have multiple layers of keymaps in order to play more than one sample at the same time and each keymap may have a different set of parameters so that the incoming note-events affect each layer differently. For example, two layers may have a different sensitivity to the velocity of the incoming note, altering the resulting timbre according to how hard the note is played. At this level, there are two basic approaches to sampler organization. In a bank approach, each instrument is assigned to a different MIDI channel and multiple banks can be stored to reconfigure the sampler. A different and more powerful approach is to associate each instrument with a patch number or ID so that each MIDI channel can be configured separately by sending controller information on the individual channel. 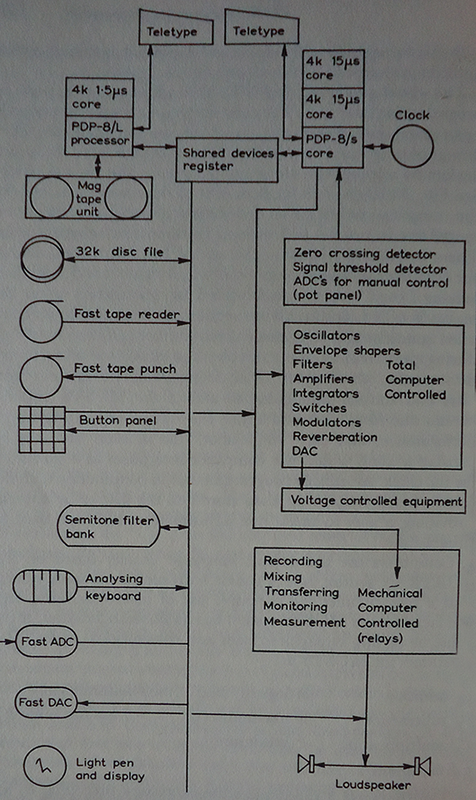 Many samplers work as described above: the keymapping system "spread out" a sample over a certain range of keys. This has side-effects that may be desirable in some contexts, such as speeding up or slowing down drum loops. However, the higher and lower-pitched parts of such a keymap may sound unnatural. For example, if a harpsichord is sampled in its lower register and then the samples are moved up to very high pitches, the high notes may not sound natural and authentic. When arranging a pitched instrument over several keymaps, the transition from one to another may be too noticeable for realistic imitation of the instrument – the art is to make transitions as smooth as possible. Some phrase samplers are more optimised for triggering single "one-shot" sounds such as drum hits. Each keymap spans only a single key, requiring a large number of zones (61 on a five-octave keyboard), each with its own settings. "Phrase sampling" aims to simplify this, particularly on interfaces such as the 16 pads on the Akai MPC series: the fact that each pad is actually a note is hidden from the user. The sampling engine does not re-pitch samples, it only plays them back. The user interface is simplified. Phrase samplers often have a groovebox format, which makes them lightweight, easy to operate and light to carry. Computer Music Inc. was started in New Jersey United States in 1972 by Harry Mendell and Dan Coren. 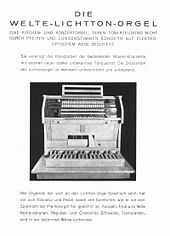 The company was established to develop and market musical instruments based on computer software. The Melodian developed in 1976 was based on the Digital Equipment Corporation PDP-8 computer and hand wired D/A and A/D conversion and tracking anti-aliasing filters. The Melodian was first used by Stevie Wonder in his album Stevie Wonder's Journey Through "The Secret Life of Plants" (1979). The Melodian was a monophonic synth with 12 bit A/D and sampling rates up to 22 kHz. It was designed to be compatible with analog synthesizers and had a feature where it would sync to the pitch of an analog synth, such as an ARP 2600. This means the Melodian captured all of the frequency modulation effects, including the touch ribbon control. It also could trigger off the ARPs keyboard so it could almost be thought of as a hybrid sampler/analog synth, making best use of the technology that was available at the time. The Synclavier System was an early digital synthesizer and sampler, manufactured by New England Digital. First released in 1977, it proved to be highly influential among both music producers and electronic musicians, due to its versatility, its cutting-edge technology and distinctive sound. Synclavier Systems were expensive – the highest price ever paid for one was about $500,000, although average systems were closer to about $200,000 – $300,000. Although this made it inaccessible for most musicians, it found widespread use among producers and professional recording studios, and it competed in this market with other high-end production systems, such as the Fairlight CMI. Though scarce, the Synclavier remains in use in many studios to this day. Fairlight Instruments was started in Sydney, Australia, in 1975 by Peter Vogel and Kim Ryrie. The company was originally established as a manufacturer and retailer of video special effects equipment. 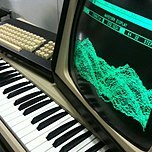 The Fairlight CMI or Computer Music Instrument, released in 1979, started life as the Qasar M8. The M8 was handwired and legend has it that it took two hours to boot up. The CMI was the first commercially available polyphonic digital sampling instrument. The original Fairlight CMI sampled using a resolution of 8 bits per sample, at a rate of 24 kHz, and used two 8-bit Motorola 6800 processors (later upgraded to the more powerful 16/32-bit Motorola 68000). It was equipped with two six-octave keyboards, an alphanumeric keyboard, and an interactive video display unit (VDU) where soundwaves could be edited or even drawn from scratch using a light pen. Software allowed for editing, looping, and mixing of sounds which could then be played back via the keyboard or the software-based sequencer. It retailed for around US$25,000. Fairlight later released the Series IIx, which increased the sampling rate to 32 kHz and was the first to feature basic MIDI functionality. In 1985, the Series III was released with two significant upgrades: bit rate and sampling rate were increased to CD quality (16 bit/44.1 kHz) and SMPTE time code was now supported. Notable users of the Fairlight CMI include Peter Gabriel, Herbie Hancock, Trevor Horn, Art of Noise, Yello, Pet Shop Boys, Jean Michel Jarre, Duran Duran and Kate Bush. Horn, considered the "Man who invented the eighties", first used his well-known sampling techniques on the album Adventures in Modern Recording, the second studio album released under the name of his project The Buggles. Saying that he was "quite fascinated by Fairlight brass and all of those kind of things that Geoffrey and I had started messing around with before he went off to join Asia", the sampling techniques on Adventures would later be used for records Horn produced like Slave To The Rhythm by Grace Jones, Art of Noise's The Seduction of Claude Debussy and Frankie Goes To Hollywood's Welcome to the Pleasuredome. E-mu Emulator (1981) was E-mu Systems initial foray into sampling, and saved the company from financial disaster after the complete failure of the Audity due to a price tag of $70,000. The name 'Emulator' came as the result of leafing through a thesaurus and matched the name of the company perfectly. The Emulator came in 2-, 4-, and 8-note polyphonic versions, the 2-note being dropped due to limited interest, and featured a maximum sampling rate of 27.7 kHz, a four-octave keyboard and 128 kB of memory. E-mu Emulator II (1984) was designed to bridge the gap between the Fairlight CMI and Synclavier and the Ensoniq Mirage. It featured 8 notes polyphony, 8-bit sampling, 512kb of RAM (1mb in the EII+ though only accessible as two independent 512kb banks), an 8-track sequencer, and analog filtering. With the addition of the hard disk option, the Emulator II was comparable to samplers released 5 years later. E-mu SP-12 (1986) was a forerunner of E-mu SP-1200. E-mu SP-1200 (1987) was, and still is, one of the most highly regarded samplers for use in hip-hop related production. Its 12-bit sampling engine gave a desirable warmth to instruments and a gritty punch to drums. It featured 10 seconds of sample time spread across four 2.5-second sections. E-mu Emax, sold between 1985 & 1995, and aimed at the lower end of the market. E-mu ESI-32 (1994) was a stripped down, far cheaper, and simplified EIIIx, and could use the same samples. The unit could accommodate up to 32 MB RAM. 32 note polyphony and sounds could be routed internally to one of four polyphonic outputs. Via optional SCSI interface, the ESI-32 could access external CD-ROM, Zip-100, and hard drives. Akai entered the electronic musical instrument world in 1984 when Roger Linn, the creator of the Linn LM-1, the Linn 9000, and the LinnDrum, partnered with the Japanese/Singaporean Akai Corporation to create samplers similar to the ones created at Linn's own company, Linn Electronics. With this came the first in a series of affordable samplers, the S612, a 12 bit digital sampler module. The S612 was superseded in 1986 by the S900. The Akai MPC60 Digital Sampler/Drum Machine and MIDI Sequencer (1988) was the first non-rack mounted model released. It is also the first time a sampler with touch sensitive trigger pads was produced by AKAI, giving birth to the popular MPC series of sampler sequencers. The Akai S1000 (1988) was possibly the most popular 16-bit 44.1 kHz stereo sampler of its time. It featured 16-voices, up to 32 MB of memory, and 24-bit internal processing, including a digital filter (18 dB/octave), an LFO, and two ADSR envelope generators (for amplitude and filtering). The S1000 also offered up to 8 different loop points. Additional functions included Autolooping, Crossfade Looping, Loop in Release (which cycles through the loop as the sound decays), Loop Until Release (which cycles through the loop until the note begins its decay), Reverse and Time Stretch (version 1.3 and higher). Other samplers released by AKAI include the S01, S20, S700, S2000, S2800, S3000, S3000XL, S5000, S6000, MPC500, MPC1000, MPC2000, MPC2000XL, MPC2500, MPC3000, MPC3000XL, MPC3000LE, MPC4000, MPC5000, Z4 and Z8. Most older samplers use SCSI as the protocol for getting sample data in and out of the machine. SCSI interfaces were either standard on the sampler or offered as an option. SCSI provides the ability to move large quantities of data in and out of a sampler in reasonable times. Hard drives, CDROM drives, Zip drives and removable cartridge drives such as Syquest and Iomega Jaz drives are the most popular SCSI devices used with samplers. Each has its own strengths and weaknesses, with hard drives being the fastest devices. Modern (after 2000) samplers use solid-state memory cards (such as compact Flash or SmartMedia) for sample storage and transfer. Fantasia, a user interface for LinuxSampler. LinuxSampler is a clone of GigaSampler by NemeSys, which was one of the first disk-streaming software-samplers on PC. In the 1990s and 2000s the increases in computer power and memory capacity have made it possible to develop software applications that provide the same capabilities as hardware-based units. These are typically produced as plug in instruments – for example, using the VST system. Some such samplers provide relatively simple sample playback facilities, requiring the user to turn to other software for such tasks as sample editing, sample recording, and DSP effects, while others provide features beyond those offered by rack-mounted units. Also in the 1980s, users on Home computers invented Trackers. Sequencers are software samplers as the real-time resampling is a required capability for the Tracker concept. Since the 1980s, Trackers were able to perform 4-channel resampling in realtime under usage of the Paula Chip on the Amiga. Since the early 1990s Trackers performed on PCs multi-track resampling in realtime as pure software solution. This was possible under the usage of highly optimized assembly code, an early example is the InertiaPlayer released in 1993. A recent PC Tracker with good sampler capabilities is for instance the Renoise Tracker. ^ Nunzio, Alex Di (2014-05-16). "The structure". MUSYS. musicainformatica.org / musicainformatica.it. Archived from the original on 2017-10-21. [figure 2] A summary that shows the position of the two PDP computers within the MUSYS system, and all the devices connected to them. ^ Hinton, Graham (2002-12-27). "The Putney Studio (1970)". EMS: The Inside Story. Cornwall, UK: Electronic Music Studios. Archived from the original on 2016-05-13. ^ Grogono, Peter (1973). "MUSYS: Software for an electronic music studio". Software: Practice and Experience. 3 (4): 369–383. doi:10.1002/spe.4380030410. ISSN 1097-024X. "[SUMMARY] MUSYS is a system of programs used to create electronic music at the computer studio of Electronic Music Studios, London. This paper describes the programming language employed by composers, and the implementation of its compiler and of other programs in the system. It is shown that by the use of a macrogenerator, an efficient and useful system can be built from simple software on a small computer." According to Cockerell 2013, this piece was "realised in 1971–72 by Peter Zinovieff at the Putney studio". ^ "Hip-hop's most influential sampler gets a 2017 reboot". Archived from the original on 2017-05-19. Retrieved 2017-06-20. ^ a b Preve, Francis (1 June 2010). "Sampler Evolution". Keyboard Magazine. Archived from the original on 18 September 2016. 1976 / COMPUTER MUSIC MELODIAN / Based on a DEC PDP-8 computer, it had then-unheard-of 12-bit/22kHz resolution. "...Mendell’s pursuit of innovation, which brought some rather momentous results during his undergraduate years at Penn. / It was then, in the mid-1970s, that Mendell invented the world’s first digital sampling synthesizer at an electronic-music laboratory that had been set up in the Annenberg Center. ... / Mendell licensed the Melodian technology to Yamaha, which used it to make a chip for commercial purposes. He also worked with Commodore. ... / A few days after our meeting, Mendell sends an email with the subject line “Exactly what I had in mind (in 1975)!”..."
^ "The Holmes Page: The Fairlight CMI". GH Services. 2010. Archived from the original on 2005-10-29. ^ a b "Fairlight CMI (Series I - III)". Archived from the original on 2007-07-03. ^ Peel, Ian (1 January 2010). "From the Art of Plastic to the Age of Noise" Archived 2013-11-11 at the Wayback Machine. Sleeve notes for the deluxe reissue of Adventures In Modern Recording, posted on trevorhorn.com. Retrieved 12 January 2016. ^ a b Ziegs, Matthias (2005). "Resampling Qualität im Vergleich" (in German). MAZ-Soundtools. Archived from the original on 2011-03-08. Retrieved 2011-02-05. ^ V., Simon (2001-05-08). "Sampler anti-aliasing and pitch-shifting comparison". www.simonv.com. Archived from the original on 2010-06-19. Retrieved 2011-02-05.